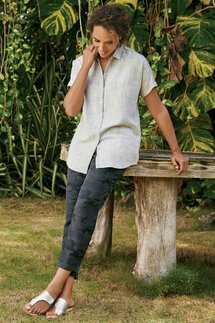 The fluid drape of this Tencel® Lyocell shirt is enhanced with the laid-back style of dolman sleeves and a longer hem in back. Contrasting thread rims the placket that's dotted with mother-of-pearl buttons. Misses 31/32-1/2" long.